Getting back to your roots can lead to some interesting discoveries. In plants, the origin of roots has frequently been a controversial topic. Recent research published in New Phytologist suggests that the development of roots might have been far more interesting than we previously thought. A recently published paper by Fujinami et al. focuses on the organisation of the root apical meristem (RAM) in lycophytes, and how this might give us clues to help us understand the early evolution of roots. To answer the question, the authors studied the cell division pattern of RAM in current lycophytes. 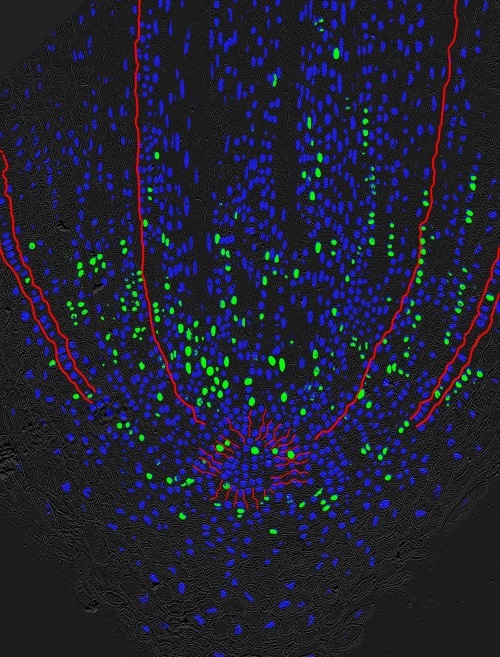 Lycopodium clavatum root tip showing S‐phase (green) and interphase (blue) cells; red lines trace the initial cells, epidermis, and the ground meristem–protoderm boundary. Courtesy of Rieko Fujinami and Atsuko Nakajima. The image on the cover of New Phytologist 215:3 shows EdU-labeled cells (S-phase cells) superimposed over DAPI and phase-contrast images of Lycopodium clavatum root apical meristem. The Lycopodium root has a region with a very low cell division frequency, reminiscent of the quiescent center (QC) in angiosperm roots. Fujinami et al.‘s finding is the first to reveal the presence of QC-like region in nonseed plants. Their results suggest that RAM organisation is more diverse than expected, and support the paleobotanical hypothesis that roots evolved several times in lycophytes, as well as in euphyllophytes. This entry was posted in Latest Posts, New Phytologist, NPCover and tagged evolution, New Phytologist, NPCover, plant science, roots, traits. Bookmark the permalink.